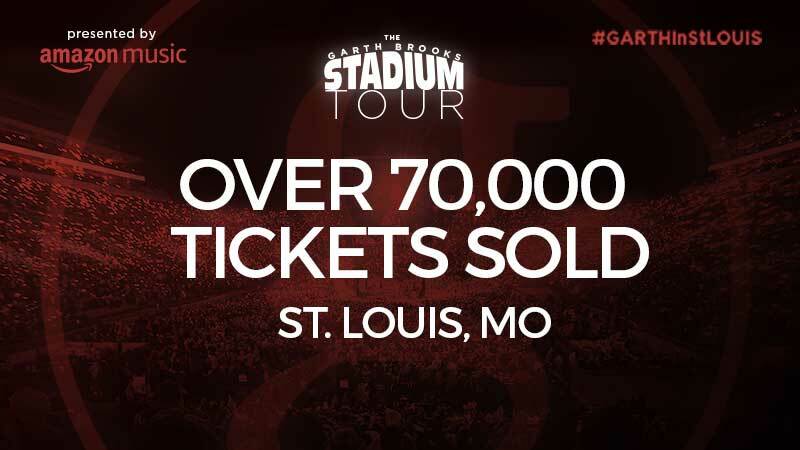 LOS ANGELES- November 16th, 2018- Garth Brooks has sold out his upcoming concert at The Dome at America's Center in St. Louis. Over 70,000 tickets were sold. This sets a record for any concert in the history of The Dome at America's Center. The concert is Saturday, March 9th at 7:00 PM. The Garth Brooks Stadium Tour is presented by Amazon Music. Garth's The Anthology Part III, LIVE, will release November 20th. It's an exciting, detailed, insider look at the electrifying concerts of Garth Brooks, with behind-the-scenes stories, insider secrets, and interviews with band and crew. It contains 5 CDs with 52 live recordings, never before seen photographs and 10 augmented reality experiences that can be seen on the Garth Live app. It also includes the new live album, TRIPLE LIVE. It's the soundtrack of the record breaking, number one tour in North American history.